Use for strength training, which is a form of slow controlled exercise that strengthens muscles, balance, coordination, flexibility and range of motion while fighting bone loss and easing the symptoms of arthritis pain. NOTE: These exercise suggestions are for reference only. 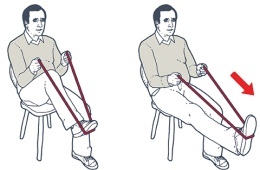 Sit or stand, place both your feet on the middle of the resistance band and hold each end of it with your hands. 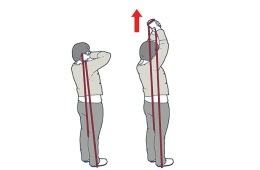 Raise your arms out in front of you to chest height, then return to your starting position and repeat 10 times. 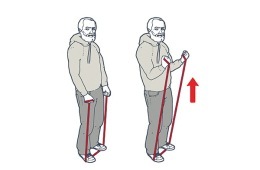 Stand up, place both feet on the middle of the resistance band and hold each end of it with your hands. Raise both arms to the side, until they reach shoulder height. then return to your starting position and repeat 10 times. Sit on a chair with your back straight. 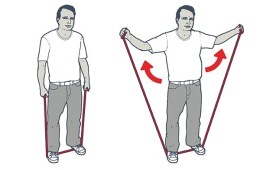 Place on foot in the middle of the resistance band and hold both ends of it with your hands. Bend your knee towards you, then straighten it back out in front of you before returning to your starting position and repeat each leg 10 times. Sit or stand and put the resistance band behind your back and hold each end of it. 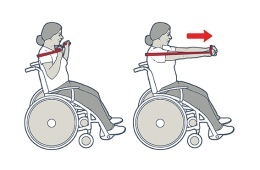 Stretch both arms out in front of your chest, then return to your starting position and repeat 10 times. Place both feet on the middle of the resistance band and hold each end of it with your hands. Slowly bend your knees into a squatting position, then return to your starting position and repeat 10 times. 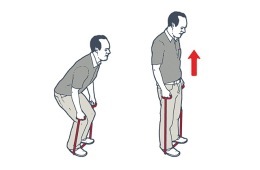 Stand up and place one end of the resistance band under the heel of one of your feet. Hold the other end of the band with both your hands, stretch the band so it runs behind your body and pull it above your head, then return to your starting position and repeat 10 times on each side.